CAPE COD – . After umpiring close to 200 games this past year, veteran official Walter Bentson has been named the first recipient of the Cape Cod Baseball League’s Curly Clement Award. Clement worked as a Cape League umpire for four decades and was inducted into the CCBL Hall of Fame in 2002. He worked 16 NCAA Regionals, several ECAC Division I Baseball Championships and two College World Series during his career. His final Cape League appearance was working home plate at the 2000 CCBL All-Star. Twenty-five ECAC umpires, along with spouses, friends, and children paid tribute to Bentson on Sunday, August 8. Despite an illness, he has worked behind the plate in more than 175 games this year at the college, junior college, high school, and top summer league levels. Bentson, a Boston native, serves on the College Baseball Umpires Association (CBUA)/New England Board of Directors and is President of the Boston Park League, the oldest amateur baseball league in the country. "Walter is not only a great umpire, but an inspiration to us all,” said Nick Zibelli, ECAC Director of Baseball Umpiring. 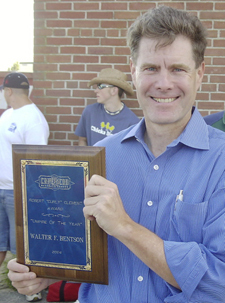 “I tip my hat to the Cape Cod Baseball League for honoring Walter with the first annual Curly Clement Award." The presentation was made by CCBL Commissioner Paul Galop and Deputy Commissioner Sol Yas, along with Zibelli. The Wareham crowd of 1,100 fans paid tribute to Bentson with a standing ovation. The ECAC is in its fourth consecutive season assigning umpires for the CCBL. There are 86 ECAC umpires assigned to the 660 Cape Cod Baseball League games this summer.